Shareholder activism continues to thrive and expand in scope and type of activist. Across the globe, activists are busy choosing their targets, preparing their campaigns and honing their attack strategies. And with shareholder activists increasingly able to have multiple company directors replaced, boards are becoming more cognisant of this eventuality and, as a result, are proactively communicating with shareholders, studying their vulnerabilities and engaging with activist agendas. FW: What do you consider to be the most significant developments in the shareholder activism space over the past 12 months or so? Feldman: In Canada, the successfully run proxy contest by Paulson & Co Inc. at Detour Gold Corporation has emboldened activists to look for wholesale change at companies, compared to the recent past where the view had been that it is virtually impossible for activists to replace more than one or two directors. We are seeing a lot of this type of activity. On the company side, boards are cognisant of this fact and as a result are being more proactive in communicating with their shareholders, studying their vulnerabilities and preparing themselves for an onslaught. Crozier: Shareholder activism continues to thrive and expand in both scope and the type of activist. The Wall Street Journal reported that through late December, activists in 2018 made public demands at 284 companies with market caps greater than $500m, compared to 252 in 2017. Activism is no longer limited to financial engineering or operational issues. M&A activism in particular, such as Carl Icahn’s recent campaign to block Cigna’s acquisition of Express Scripts, has become far more common. Investors other than special purpose hedge funds are now commonly entering the fray, rather than selling or silently backing a traditional activist. So-called short activists, looking to profit from a decline in a target’s stock price, are also increasingly active. Koons: While 2018 did not see the prevalence of mega-cap fights of 2017 like Proctor & Gamble, ADP, Arconic and General Motors, it was still a very busy year for activists with high-profile engagements at targets such as Newell Brands and Campbell Soup. 2017 was the first time that more than 50 percent of activist engagements occurred outside of the US. Elliott is a prime example of an activist who is comfortable working in an extremely wide range of geographies. While some countries will continue to be less hospitable to activism than others, the globalisation of the ownership base of larger companies creates an inexorable movement toward greater transparency between shareholders and the companies in which they invest. In the US specifically, it remains to be seen what changes will come out of the US Securities and Exchange Commission (SEC) Roundtable that took place in November 2018. This very important discussion focused on key aspects of the US proxy system, including proxy voting mechanics and technology, the shareholder proposal process, and the role and regulation of proxy advisory firms. Grossman: Consistent with 2017, M&A continues to be a driver of shareholder activism, with activists seeking opportunities to create event-driven shareholder value. Globally, we saw numerous activist campaigns in 2018, aiming to catalyse M&A, push for industry consolidation or block a deal. Furthermore, M&A activism’s reach has continued to expand outside the US as activists seek new opportunities to create value. We also continue to see activist campaigns targeting chief executive officers (CEOs). As the face and voice of the company, the CEO can, unsurprisingly, become a natural target as activists targeting a company are likely unhappy with its performance. Specifically, we have recently seen CEOs targeted as part of a proxy contest to remove a minority of a company’s board of directors. This is in part because activists have discovered the Institutional Shareholder Services (ISS) framework does not make it explicitly more burdensome to target a CEO. FW: What are some of the common issues being raised by activists? What factors are driving campaigns? Crozier: Despite all of the changes in activism over the years, the market value of a company’s stock is always the ultimate issue – does the market’s valuation reflect the company’s true value and, if not, what is the best way to unlock additional value for shareholders? Valuation disconnects can come from a variety of sources, including poor capital allocation, operational faults and misguided strategies, including M&A, and the appropriate solution to the particular cause of the disconnect at a target company ultimately drives the activism campaign. While activists will usually raise ancillary issues such as governance concerns, they must first make a compelling valuation case in order to be successful. Koons: Common themes are the need for improved performance through better management and board oversight, return of capital to shareholders, opposition to previously announced M&A deals, support for the sale of the company to a strategic or financial buyer, and support for divestitures or spin-offs of one or more corporate divisions. In addition to these strategy and governance related themes, many activists such as ValueAct and Jana are bolstering their case for change at the companies they target with issues surrounding long-term sustainability. The most experienced activists do a great deal of research on the target company as well as its shareholder base prior to engagement. Feldman: Activists are economic actors. So the main driving force is a period of long-term underperformance. Another key area of concern is in governance, particularly when shareholders feel that the board is overpaid, disengaged and not aligned with shareholders. The perfect storm occurs when underperformance and governance failures combine. Many ‘activists’ are long-term holders in companies that, over many years of support, followed by quiet engagement, feel they are left with no other alternative but to launch a public proxy campaign. It is expensive and time consuming to do this, so it is always a last resort. FW: Are any sectors or industries particularly vulnerable to being targeted by shareholder activists? If so, why? Koons: Combined, the technology, industrials and consumer sectors accounted for almost 60 percent of the capital deployed in new activist positions through the third quarter of 2018, a significant jump from the average of 2015-17. We expect that market volatility, especially around the technology sector and its capital allocation, to contribute to more instances of activism. 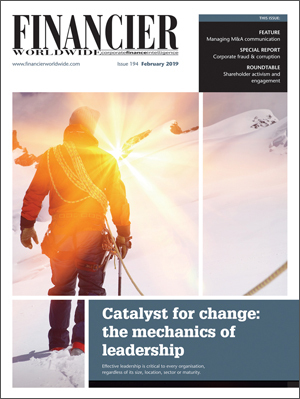 Many long-established industrial companies that are still grappling with their transition to the 21st century global economy have seen challenges to their board composition, as well as demands for greater clarity around the business structure. Grossman: The energy sector appears to be an interesting opportunity for shareholder activism. Despite improving oil prices in the last three years, energy stocks have not uniformly followed this trend. In 2017, the energy sector of the S&P 500 experienced a decline, unlike any other sector of the S&P 500 that year. In the last year, annual returns of energy companies in the S&P 600 have declined approximately 13 percent compared with gains of almost 9 percent for the broader index of S&P 600 companies. The energy sector’s underperformance alone could make this sector attractive to activists. Additionally, with the increased focus on ESG issues, particularly concerning sustainability and climate control, and their impact, the energy sector will likely remain a key target of activist shareholders with an ESG focus going forward. Feldman: All sectors are at risk. However, the long-term decline in mining and energy companies makes these industries obvious targets. We may also start to see more activity in the cannabis space as this industry starts to consolidate, especially if performance is lacking. Crozier: Given the recent volatility in the markets, it is probably dangerous to predict with any certainty a particular sector’s vulnerability. Sharp price declines at companies across the board have undoubtedly provided attractive entry points for activists at numerous companies. Since healthcare is a defensive sector and so is potentially attractive during a downturn, it is likely to continue to be a major focus area for activists in 2019, as it was in 2018. In addition to Carl Icahn’s campaign at Cigna to block the acquisition of Express Scripts, Sarissa Capital, a healthcare focused activist, targeted Ironwood Pharmaceuticals, and a group of small holders at Japan’s Takeda Pharmaceuticals tried to block its merger with Shire. FW: Looking around the globe, which countries and regions appear to be hotbeds for activism? Are there parts of the world where interest in activist strategies is clearly rising? Feldman: Canada is ramping up once again. There was a period of time where there was lots of activity in the country and then it slowed down. These days Canada has never been busier or more active. Activists know that Canada is a very shareholder friendly environment. For example, shareholders can always call a special meeting, there is a lot of flexibility in the solicitation rules and the shareholder base is quite small, so it is easy to get to know the investment community. These factors, coupled with the failure of many companies to perform, are attracting huge interest from global activists, and occasional activist investors. Crozier: Activism outside the US continues to increase. According to a recent Wall Street Journal story, 148 non-US companies were targeted by activists in 2018, compared to 125 in 2017. The UK, Japan and Canada witnessed significant increases in activism in 2018. In the UK, the weak pound, uncertainties surrounding Brexit and a shareholder friendly corporate governance regime contributed to a sharp increase in campaigns, a large percentage of which were led by non-UK investors. In Japan, which historically had been extremely hostile to activism, recent reforms, such as the adoption of the Stewardship Code in 2014 as well as other changes that encourage shareholders to be proactive and managements to engage meaningfully with their investors, have resulted in a sharp increase in activism, compared to a downward trend in the rest of Asia. Grossman: As activism at US companies has begun to taper-off with the decrease of ‘low-hanging fruit’, activists have increasingly begun to look outside the US for opportunities, particularly in Europe and Asia. The EU recently amended its Shareholders’ Rights Directive to encourage shareholder engagement, facilitating greater activism. Moreover, 2017 reports indicate that Europe experienced record levels of activism, fuelled, in part, by US activists looking to increase shareholder value abroad. In 2018, we have seen roughly the same number of campaigns targeting European companies, but there has been a sharp decrease in the activism capital deployed at European targets. Additionally, while shareholders in Asian companies have historically taken a more passive approach to engagement, investors have recently become more amenable to direct and more active company engagement, which we saw numerous times in 2018. Koons: While activism in the US will not recede in the foreseeable future, recent market volatility globally will only present more opportunities for activists. Activists have not been deterred from expanding into geographies that previously have seen little or no shareholder activism. The UK continues to be the dominant target for activists in Europe, accounting for just over half of all engagements. We may well see a number of mega-cap European companies targeted in 2019. In Asia, there is continued evidence of the movement away from the traditional passive approach to investing. The growing ownership share of Asian equities by foreign investors, as well as a more open approach to activism by local investors, has made the overall climate in Asia, and Japan in particular, more hospitable to activism and overall governance reforms. FW: Have any recent shareholder activist campaigns caught your eye? What lessons can we draw from the way they were conducted, as well as their outcome, such as board-level resignations or strategy changes? Grossman: We continue to see the re-emergence of withhold campaigns, in which an activist attempts to persuade stockholders to withhold votes from company-nominated directors. Several years ago, this tactic emerged as a way to end-run advance notice deadlines for director nominations and send a strong message to the board that stockholders are dissatisfied with the company’s governance, management or corporate strategy. In contrast to a full blown proxy contest, investors do not have to propose their own nominees, are able to target board members without complying with a company’s advance notice deadlines and often spend less. In April 2018, Elaine Wynn, a co-founder and the largest stockholder of Wynn Resorts, launched a withhold campaign, urging stockholders to vote against long-tenured director John Hagenbuch at the company’s 2018 annual meeting. Koons: Recently, Newell Brands faced a proxy fight by Starboard Value Fund to replace the entire board of directors at the 2018 annual meeting. Newell was faced with the challenging circumstance of the departure of a substantial minority of its board and a stock price that was off significantly year over year. Through vigorous engagement with the shareholder base, the company ultimately was able to reach a settlement whereby representatives of both Starboard, as well as Icahn Enterprises, were added to the board, bringing in a strong shareholder perspective. Management and the board demonstrated a willingness to adapt and make necessary changes to be responsive to their shareholders in order to best position the company for long-term success. Feldman: The most high-profile case in Canada over the past few years was the Paulson versus Detour fight. Paulson was successful because it focused on the single most important thing in any campaign: being attuned and aligned with its shareholders. Paulson was in constant contact with shareholders, was consistent in its messaging and strongly presented a well thought out strategy for change. To be successful, you have to do this work. FW: What insights can you provide into the various approaches activists are taking to exert their influence and effect change? To what extent have tactics evolved in recent years? Crozier: Activism has become far more sophisticated in the last several years as potentially lucrative returns have attracted large, well-capitalised players willing to spend significant amounts of time and money on campaigns. Perhaps the most effective tactic that has evolved as a result is the recruitment of well-qualified, experienced dissident director candidates, often with the help of headhunters, who are able to withstand, if not surpass, comparisons with incumbent directors. In addition, it is now standard for activists to produce detailed, well considered white papers detailing their concerns and proposed solutions, which can provide the foundation for the activist’s credibility with other shareholders. Furthermore, leveraging the willingness of traditional institutional investors to support activists, including publicly, has been a particularly effective tactic. Finally, the outsized assets under management (AUM) of the most effective activists allows them to continue to hold their position in a targeted company for the time needed to pressure management to address their concerns. Koons: More sophisticated activists are spending time in and around the wider investment and governance community to understand the focus and priorities of funds such as BlackRock, Vanguard and State Street. The increasingly large ownership that these index funds have in most mid-cap and larger companies makes their votes pivotal to the outcome of a contested election. Understanding how these funds think about governance and long-term sustainability is key to winning their vote. Larry Fink’s letter of January 2018 to CEOs of major corporations stated that boards of directors must articulate clear goals to achieve long-term growth. Feldman: We have been involved in numerous situations that have not gone ‘public’. Most of the activity happens privately and without major escalation. Most well advised and thoughtful boards understand the importance of engaging with their shareholders and most experienced and thoughtful activists understand the importance of making reasonable requests for change in the context in which they are operating. A perfect example of this is where an activist and a company agree on a mutually agreeable independent director who has industry experience and credibility. This is the most common outcome we see. Of course, there are not always thoughtful parties on both sides, which is what leads to the escalations that can culminate in full scale proxy battles – something most shareholders view as a costly and a wasteful use of company time and resources. Grossman: In 2018, board representation demands were a particularly popular method for activists to exert influence over companies. Recent reports have shown a greater than 80 percent increase in the number of board seats won by activists compared to the same time period in 2017 and a 30 percent increase over the total number of seats won in all of 2017. Additionally, in 2018, just over a third of activist campaigns pursued board seats. Moreover, in 2018, campaigns pursuing ‘long slate’ nominations – those seeking to replace at least 50 percent of the board – reached a record high since 2014. Campbell Soup’s proxy fight with Third Point illuminates this trend. Third Point has advanced a massive campaign to discredit and ultimately remove Campbell’s board in order to pursue strategic transactions. Third Point also publically indicated that the company’s current board should not select a new CEO until new directors are elected. FW: How are legal and regulatory developments affecting this space? To what extent do shareholder-friendly laws, for example, facilitate activism and make campaigns more likely to succeed? Koons: An activist’s ability to succeed in a campaign is directly tied to their ability to identify and connect with their fellow shareholders, as in any campaign. Access to the shareholder data varies greatly from region to region. In Australia, an activist will be able to see the entire shareholder registry, while in other parts of the world the shareholder base is much more opaque. The US system has traditionally been a complicated mix of institutions, custodian banks, beneficial owners and registered shareholders that an activist must navigate to be successful in a proxy contest. One area of potential change that the SEC panel discussed at the November roundtable was around the ‘NOBO-OBO’ framework, whereby the identities of a significant portion of the beneficial shareholders are currently not directly visible to the company or an activist. A change to this framework that would allow complete transparency would significantly alter the playing field. Grossman: A government’s legal and regulatory framework can pave the way for activism, making campaigns more likely to succeed. One recent US example is regulators encouraging board diversity. In 2016, Mary Jo White, then-chair of the SEC, stated “boards with diverse members function better…This is precisely why investors have – and should have – an interest in diversity disclosure about board members and nominees”. Since then, increasingly, members of Congress have called on new SEC chairman Jay Clayton to continue these efforts to develop and propose corporate board diversity rules to expand company disclosure requirements. Additionally, states and municipal legislatures, including those of Massachusetts, California, Illinois and Pennsylvania, have continued to propose, and in the case of California adopt, measures in support of increased board diversity. Such actions signal that it may be a priority for regulators and legislatures going forward and may fuel activism around the issue. Feldman: Canada is extremely activist friendly in terms of how the laws are set up. That said, there is a lot of unchartered territory that allows a board to test an activist’s resolve. For example, something as simple as sharing a shareholder list, which is required to be provided to an activist under Canadian law, can become an issue, where a board refuses to provide all of the information and then forces a shareholder to challenge them either in court or with the securities regulator. The idea on the part of the board is to test the activist’s resolve. We are trying to work with the regulators to see if we can take this out of the regime but that remains to be seen. We used to see some boards engage in ‘vote buying’ – paying brokers to deliver favourable votes in a proxy fight, and while it is not yet illegal, the securities regulators have made it quite clear after some egregious uses of vote buying by some boards, that this practice will soon be extinct. So while Canada is great for activism, works needs to be done to make it even better. Crozier: Shareholder friendly laws that permit direct action by shareholders, such as proxy fights to replace board members, are critical to effective activism in markets that feature dispersed shareholder bases. In such markets, collective action by shareholders is necessary in order to maintain accountability over managements and boards. While there are numerous stories of change being accomplished through jawboning by large holders behind closed doors in markets that feature highly concentrated shareholder bases, such tactics are not effective elsewhere. Historically, countries with Anglo-Saxon legal structures, such as the US, UK, Canada and Australia, have been the most receptive to activists. In Japan, where historically activism had been largely futile, recent legal reforms, such as the 2014 Stewardship Code, have helped touch off a significant increase in activism. FW: What can companies do to proactively monitor the market, identify red flags and anticipate the onset of an activist campaign? Feldman: Very simply, companies need to think like activists. Run the same screens to assess vulnerability that activists run, engage with shareholders and make sure that the right in-house team is ready at all times. Crozier: Perhaps the most important step companies should take is to have an effective investor relations group that is in regular contact with investors, understands their concerns, and is able to candidly express those concerns to senior management and the board. Issuers who can credibly demonstrate to those investors that their concerns have been heard and responsive actions are being taken may avoid activist intervention. By contrast, activists often target companies after being contacted by long-term fundamental investors who are unable to sell out of their position and who are frustrated by the lack of responsiveness to their concerns. Finally, companies should engage a stock monitoring firm to track trading in the stock to provide advance warning of accumulations by activist or other problematic holders. Grossman: A couple of basic steps companies should take to minimise the risk of activism include maintaining a ‘stock watch’ programme to detect accumulations of stock as early as possible and monitoring non-traditional investor forums, such as presentations at investor conferences and investment letters from activists. Companies should also consider putting together a team – one internal and one consisting of outside advisers – to create an activism preparedness ‘playbook’. The company should coordinate among the team, including internal and outside counsel, public relations advisers, a proxy solicitor and key members of the management team, to ensure they relay a consistent message. A financial adviser is also useful, particularly if activist attention surrounds the company’s financial performance, capital allocation policy or strategic alternatives. Koons: All companies should have an experienced outside team to monitor the trading and the shifting landscape of their shareholder base. An experienced team will be able to spot unusual trading activity and, in many cases, identify its origin. Stockwatch has many similarities to submarine warfare. Since trading in public shares is done in a less than transparent manner ‘under the surface’, it takes a skilled and experienced analyst or ‘sonar man’ to understand if the big block trade that just settled was an activist accumulating shares or simply a mutual fund doing some portfolio rebalancing. Investor relations needs to be more than a once a quarter function of an earnings call followed by questions and answers from investors. FW: What strategies should companies consider to reduce the likelihood of becoming embroiled in an activist campaign? What shareholder engagement methods might be deployed, for example? Crozier: It is vitally important for companies to understand the makeup of their shareholder base. The company should evaluate which institutional holders, in particular, will be critical to victory in the event of a proxy fight, the ultimate threat in almost every activism campaign. It is then essential to engage with those holders, understand their concerns and respond meaningfully to such concerns. Given the recent sharp increase in holdings by index funds, for most companies support from the large indexers, Vanguard, BlackRock and State Street, will be essential. As ‘permanent capital’ such funds will generally be supportive of a board and management that enunciate a clear, compelling and, most importantly, credible long-term value creation strategy. However, it takes time to convince shareholders of the credibility of such a plan and the ability of the board and management to execute it. Consequently, outreach to such investors should be undertaken as part of the overall investor relations programme, but unlike engagement with other institutional investors, participation by appropriate members of the board is usually critical, as is attention to the indexers’ particular areas of concerns, such as environmental and social issues. Grossman: We recommend that companies conduct a vulnerability self-assessment to anticipate and pre-empt activist proposals. For example, a company may wish to ask itself: How does our performance compare to peers? Do we have the right capital allocation policy? Are there alternative financial or business strategies that could be pursued? Or are there governance or business practices that could attract activist attention? The companies that have conducted this type of assessment prior to any activism are generally the best-suited to confront an activist. The assessment also helps a company to understand whether there are preventative steps that it can take on its own before an activist has surfaced. Koons: Preparedness for shareholder activism can be compared to foreign policy. The greater your level of engagement and diplomacy in times of peace, the greater likelihood that you will be able to avoid times of conflict. The three things a company should focus on are, first, know your owners. It is important to closely monitor your stock ownership and stay informed on the differing perspectives and priorities of your various shareholders. This will inform your shareholder engagement strategy to both investment and governance personnel, which should cover long-term strategic issues that are likely to be areas of focus for an activist. Second, know your company. You must have an honest and objective sense of how your company is performing in relation to its stated objectives and peers, as well as how your board and management are contributing to that performance. Third, know your team. Having a collaborative team of outside advisers that knows your company intimately will help you in your year-round engagement and evaluation process, thus positioning you to minimise the threat of activism and to maximise your chances of being successful should such a threat become unavoidable. Feldman: If shareholders have ideas, boards should listen. It does not mean that a board has to do anything an activist wants. But what goes a long way is showing that the ‘engagement’ is not just lip service to ‘check the box’ but rather a good faith effort to understand the activist’s perspective, coupled with the board sharing its perspective on the issue. This is about human relationships. If people come to the table with the goal of doing right for the company, then a lot of conflict can be avoided and better outcomes that incorporate multiple perspectives are possible. FW: With social media now a powerful tool used by activists, how can companies derive benefits from these platforms to achieve their own objectives? Feldman: There are limits to the use of social media when it comes to engagement with shareholders. As long as everything is being done legally, social media is just another tool to deliver key messages to the company’s stakeholders, some of whom may no longer use the traditional sources of information gathering, which can result in broader outreach. Koons: The tactics employed to reach retail shareholders are quickly evolving. We have seen activists mail individual video players to garner votes in a proxy contest as well as companies send instant messages with voting instructions via Facebook. The ability to produce video content geared toward retail shareholders quickly and inexpensively has given activists, as well as companies, new means by which to articulate and amplify their messages. The irony of our interconnected world is that it is more challenging than ever to get people’s attention. Companies, as well as activists, need to be creative in order to make their messages stand out from the daily noise of our lives. Grossman: In recent years, activists have launched increasingly sophisticated campaigns that attract strong media interest. Activist tactics include, among other things, issuing ‘white papers’ and videos describing activists’ rationale for strategic and operational proposals, engaging with institutional and other shareholders in advance of a contest and collaborating with other activists. The best ‘defence’ for a company is to be proactive, all in advance of an activist surfacing. Social media platforms, as well as more traditional investor forums, such as presentations at investor conferences, analyst reports and investment letters, can provide valuable information companies can utilise as part of their preparedness actions to anticipate and pre-empt activist proposals in order to understand investors’ perspectives on performance, strategy and governance, and to consider changes to the company as appropriate. Crozier: Social media can be a powerful tool to ensure that the appropriate messages regarding the company’s value creation strategy are delivered to critical elements of its shareholder base. In most cases, social media is not the best means of communicating with actively managed institutional investors who presumably are in regular contact with the company. If a company cannot communicate directly and effectively with its key institutional investors, no amount of social media, no matter how cleverly crafted and targeted it is, will suffice. Social media, however, can be a particularly effective tool for communicating with individual holders whose support can be outcome determinative in a proxy fight at companies where they make up a large percentage of the shareholder base. FW: Looking ahead, how do you expect shareholder activism to evolve? Are campaigns set to ramp up the pressure on boards, challenge corporate strategy and transform company culture? Koons: Shareholder activism will continue to expand to new geographic regions as the trend toward the globalisation of the shareholder base accelerates. Shareholders of all types will demand greater insight into a company’s long-term strategic vision. Market volatility will only present more opportunities for activists to accumulate substantial ownership positions in target companies and be in position to make the case for change to their fellow shareholders. Corporate boards must demonstrate to their investors that while they are comprised of a diverse mix of skills, experience and points of view, they agree upon a long-term strategic vision for the future of the company they oversee. Failure to articulate this vision will invite the engagement by a shareholder activist. Grossman: Though tactics may evolve or disappear and re-emerge, activism will likely remain a key asset class used by funds to generate shareholder value. Shareholder activism has become an accepted strategy across global markets with investors using activist tactics to bring about change, even in regions once believed to be either unfriendly to activist shareholders or structurally difficult for activists to execute the strategy. Activism has changed the methods and manner in which companies engage with shareholders and is likely here to stay. Though assets under management held by activist funds have stabilised, the acceptance, and in some cases endorsement, of activists by traditional institutional shareholders leaves fertile ground for a continuation of activist campaigns in the US. In Asia and Europe, activism will also likely continue to expand as investors seek opportunities to create shareholder value. Crozier: It is important to recognise that activists are no longer the sole direct catalysts for change. While activism has evolved dramatically over the last several years, the ultimate goal has not, and will not, change: to put pressure on the board to deliver greater value to shareholders in the short- to near-term. Governance, cultural and other issues are secondary to that ultimate goal. Companies, however, are increasingly proactive and are undertaking new initiatives that are not designed to create immediate shareholder value enhancement in order to address concerns of their major index investors. Due to the large size of index funds’ holdings in most companies as a result of the massive investment inflows to such funds during the bull market, many companies view the large index funds with their seemingly limitless investment horizons as bulwarks against activists. Consequently, companies are eager to gain the support of these large holders by addressing their particular concerns. For example, in recent years there has been a dramatic increase in board diversity, at least among large cap companies, as the result of the index funds’ focus on that issue. Similarly, the recent recognition by the index funds of the impact environmental concerns can have on value creation in the more distant future has caused boards and managements to develop programmes to address those concerns. Feldman: Activists prepare for battle with teams of experts who know how to win. Before the pressure campaign begins, a lot of preparation is required. Recent history on various fights provides great lessons and precedents. So in theory, with time, everyone gets smarter or at least a little wiser. At the same time, boards are getting smarter and understand the importance of engagement. The result being, that if you have two sides who are reasonable, you can come to very quick solutions – where one or both sides are not, the situation can very quickly spiral out of control. It really depends on the people involved and how far apart they are philosophically on the future direction of the company. Jonathan Feldman is a partner at Goodmans, where he heads one of the firm’s business law groups. His practice focuses on corporate and securities law with an emphasis on mergers and acquisitions. He has extensive experience acting for buyers and sellers in a wide range of industries for private and public companies. He has been involved in a number of contested shareholder matters, including proxy contests representing both dissident shareholders and boards of directors. He can be contacted on +1 (416) 597 4237 or by email: jonfeldman@goodmans.ca. Arthur B. Crozier is chairman of Innisfree M&A Incorporated of New York and of Lake Isle M&A Incorporated, Innisfree’s wholly-owned UK subsidiary. Mr Crozier’s practice includes the representation of US and international clients in a wide variety of transactions and proxy contests, as well as annual and special meetings. In addition, he counsels an international roster of parties on corporate governance, shareholder engagement and executive compensation issues. He / She can be contacted on +1 (212) 750 5833 or by email: acrozier@innisfreema.com. Charles A. Koons is managing director of the activism and contested situations advisory group at Morrow Sodali. He has over 23 years of experience as a trusted adviser in proxy contests and M&A to both corporate issuers as well as shareholders, previously as managing director of MacKenzie Partners. He provides year-round as well as special situation counsel to companies on how to best position themselves within the investor community. He can be contacted on +1 (212) 300 2473 or by email: c.koons@morrowsodali.com. Richard J. Grossman focuses his practice on proxy contests, responses to shareholder activists, corporate governance matters, mergers & acquisitions, and leveraged buyouts. Mr Grossman has advised many companies with respect to corporate governance issues and responses to shareholder proposals. He also has represented companies in contested proxy solicitations and other contests for corporate control as well as unsolicited acquisition proposals. He can be contacted on +1 (212) 735 2116 or by email: richard.grossman@skadden.com.